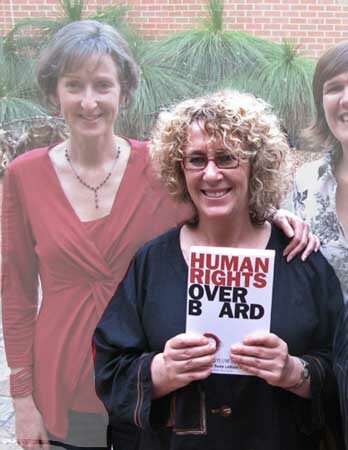 Photo: Linda at the WA launch of Human Rights Overboard, with Carolyn Fleahy and Lucy Fiske. The 2008 Annual General Meeting came and went, marking the start of our eighth year of operations. While most of our AGM's have been private gatherings, we tried to make it a public event and attracted Curtin University's Human Rights professor Linda Briskman to be with us, and speak for us. The meeting was as small or even smaller than our previous AGM's - but Linda was not fazed by numbers. Below are her contributions to the AGM, both for the local paper, the Fremantle Herald, and her delivery at the meeting. Professor Linda Briskman is the Dr Haruhisa Handa chair of human rights education at Curtin University. She has received the award to deliver the Eileen Younghusband lecture in South Africa in July 2008, for her work on the People's Inquiry into Detention. She is the author of two other books, Social Work with Indigenous Communities and The Black Grapevine, and one of the co-authors of Human Rights Overboard: Seeking Asylum in Australia (see below). Professor Linda Briskman is the Dr Haruhisa Handa Chair of Human Rights Education at Curtin University and is co-author of the award-winning Human Rights Overboard: Seeking asylum in Australia. She will be the guest speaker at the Annual General Meeting of Project SafeCom to be held at Kulcha at 6pm on 5 February. Human rights in Australia are at a crossroad. In recent years we have witnessed the erosion of rights and civil liberties in a number of ways. These include the failure of Australia to sign the declaration on the rights of Indigenous peoples, the imposition of tough anti-terrorism laws and the cruel and unjustifiable treatment of asylum seekers. A combination of social movements and indefatigable activists worked tirelessly to expose and challenge policies that shamed the nation. There are glimmers of hope on the horizon. A consultation process is to begin which will hopefully result in human rights legislation enshrined throughout the nation. The apology to Indigenous peoples creates hope that new directions are underway. The removal of the harsh excesses of the mandatory immigration detention regime has seen the abolition of temporary protection visas, faster processing and more humane treatment of asylum seekers. The election of Obama signals a new era in the reinstatement of civil liberties, particularly the closure of the Guantanamo Bay facility, from which Australia may take some inspiration. Given the prospects of hope, what then is the place of those grass-roots movements that have flourished in Australia for more then a decade? It should certainly not be complacency until the cautious optimism is transformed into decisive and legislatively-bound action that secures the rights of all Australians beyond populist politics. Delving beneath the optimism reveals that there is still much lobbying required. Despite the apology, the plight of Indigenous peoples on all socio-economic indicators remains dire. Although incremental improvements to asylum seeker policy have taken place, these changes are not enshrined in legislation and can be changed at the whim of government. The opening of the maximum-security detention facility on Christmas Island is a severe blow to refugee activists. Moreover there are no guarantees that human rights will be part of the legal framework of this country as significant pockets of resistance exist. We know from the experiences of the last decade how readily human rights tenets can be ignored. To ensure we have a just and inclusive society where we can hold our heads high on the global stage, civil society groups must continue to thrive. It is a great pleasure to be speaking about the importance of grassroots activism from the heartland of such activism - Project SafeCom. For those of us who are passionate about human rights issues and social activism we need to stand back and contextualise our actions by looking at the history of social movements throughout the ages. In recent times social action has become so 'normalised' that academic Verity Burgmann describes collective action as crowded space. We can all probably name from the top of our heads key social movements in our society including our particular favourites - Indigenous and asylum seeker rights - as well as organising to advance the rights of gays and lesbians, people with disabilities and environmental rights to name but a few. As we know, methods vary among different groups within each particular social movement ranging from direct action to creating awareness through using the arts. In Australia some of the most critical movements have been in the field of Indigenous rights, particularly land justice, asylum seeker rights and the peace movement, including against the Vietnam War. Environmental movements are on the increase. I don't know if anyone has ever mapped out all the grass roots movements involved in the various campaigns for justice but it would be a worthwhile project. The success or otherwise of grassroots social movements is hard to gauge but one of the successes is in fact the mere right to dissent. In many countries the 'otherwise' is often to the forefront as people are persecuted for their beliefs and actions. In Australia we have (at the moment) relative freedom to exercise our voices. But how successful have we been? Often we are paralysed by our failures. How long did we have to wait for a government apology to Indigenous peoples; how long did we have to wait for the Temporary Protection Visa and the Pacific Solution to disappear from the Australian landscape? How long will we have to wait for the draconian anti-terror laws to be revised? How long will we have to wait before environmental concerns are given the attention that is so urgently required? Most of us who work in grass roots activism have experienced anger, frustration and despair. But surely this is all the more reason why we need to persevere in our struggles for rights and justice. Grass-roots organisations are often built from emotion - unlike more formal organisations that have a so-called rational basis to their formation. This does not mean such organisations have to adopt the same methods in working for broadly the same ends. One of the strengths for example of the asylum seeker rights movement is that each organisation (and there were many) brought its own skills to trying to achieve the end of mandatory detention ranging from direct protest and subversion to extending the hand of friendship. It is to asylum seeker activism that I now specifically turn as it has been an area where I have been immersed for many years and one in which Project SafeCom has played and is still playing an important role in all sorts of ways - vigilance, information gathering, speaking out and community and media awareness for example. Regrettably, there is a perception among some people that the worst is over and we can happily retire. This is understandable to some extent as many people put on hold their lives and families for a good many years to fight for the rights of detained asylum seekers. Many activists simply burnt out and need to be given a reprieve. But as we know it is not over. To be fair, the practices have been improved to some extent. Detained asylum seekers experience more humanity. But the changes that have occurred are not enshrined in legislation, mandatory detention is still on the statutes, the abomination of the maximum security detention facility on Christmas Island is now open and Australia is assisting Indonesia to thwart asylum seekers attempts to leave those shores in order to seek safe haven in Australia. We read with horror about the actions of the Thai government in turning back to sea hundreds of Muslim Rohingans from Burma and the resulting deaths of many. But the media here made scarce comment about the asylum seekers, including a nine-year old boy, who died en-route to Australia just a few weeks ago. The government says even less. I will briefly turn to the example of Indigenous rights in this country, another of deep concern to Project SafeCom. Many of us, Indigenous and non-Indigenous, were buoyed by Rudd's apology in early 2008 and indeed it was a moving event. But what since? Not much? So little in fact that Indigenous people are now contemplating taking their discontent about the Northern Territory intervention to the United Nations as there is a failure to do act in Australia. And now that the global crisis has taken hold and there is an emphasis on propping up Rudd's 'working families' so that they consume for the sake of the economy, where do the economic and social rights of Indigenous peoples fit in. How is the rhetoric of 'closing the gap' actually going to be realised? I would like to think there is hope on the horizon as the federal government has begun a consultation process to contemplate the introduction of a federal bill of rights. This includes a formidable team including Frank Brennan who has been a consistent advocate for the rights of both asylum seekers and Indigenous peoples. But there are no guarantees as there is significant opposition to such a move and we need to see whether populist politics will play out again, particular when we have a cautious conservative Labor Party in power. We need to remember what happened in Western Australia when there was optimism that human rights legislation would be enacted. There was a consultation process. Then there was nothing. In supporting human rights legislation we need to emphasise that it is not all about the law and judges and courts, but also about establishing a culture in which the human rights of all are protected and where diversity is valued. It is only then that we can truly cast aside the Howard vision of a mono-cultural and bunkered society. In so doing we have to ensure that those responsible for developing and implementing policies have some non-negotiable standards. I have been involved in training the Victoria police in human rights. The emphasis has not been on legislative-compliance alone but building a culture where the rights of all are respected. As a social worker I also feel bound by a professional ethos, with a code of ethics that affirms the Universal Declaration of Human Rights and prompts us to challenge injustice. But as we know professionals and the organisations in which they work are often slow to act when faced with day-to-day operating pressures which may be antithetical to human rights. Beyond the formal approaches, we surely have an ethics of responsibility to all of humankind and to a quest for our common humanity. This is the ethic that grass-roots organisations uphold. If a charter or bill of rights helps us in our quest to be human rights defenders, I fully support it. There are a lot of myths about human rights legislation and in a talk last night at the University of Western Australia, prominent QC Julian Burnside debunked most of them. Two things he said particularly resonated with me. He pointed out that one of the criticisms that opponents of a bill of rights proffer is that it is seen as getting in the way of what governments do. Well let's hope so. Another point he made is that one of the concerns is that such legislation would give disproportionate power to minorities. And as Julian pointed out this is indeed so and is the way it should be. For the rights of the majority population are already well protected but it is those vulnerable groups on the margins that should be the focus of our quest in seeking rights-based solutions. Turning back to grassroots organisations, there remains the question of their ongoing role and there is little doubt that our society would be diminished if it were not for the vigilance, courage and independence of such groups. Collectively such organisations offer a mix of ideology, capacity and passion that sustains us when we are in a political climate that presents some hope but much despair. So what can grass-roots organisations offer in this climate? One strength of modern day grassroots activism is the capacity to mobilise people quickly including through mobile phones, websites and email lists. You may remember the anti-deportation campaigns of a few years ago when text messages were sent by activists encouraging people to do their best to disrupt flights. This capacity to act quickly combines with long-term goals to bring about a just society. Organisations like Project SafeCom are not out to win the popularity stakes with government; like other organisations the emphasis is on bringing about an inclusive society where human rights are not violated and where human rights tenets are to the forefront of our thinking.